← Oy! What’s with the house? I expect to see y’all there! 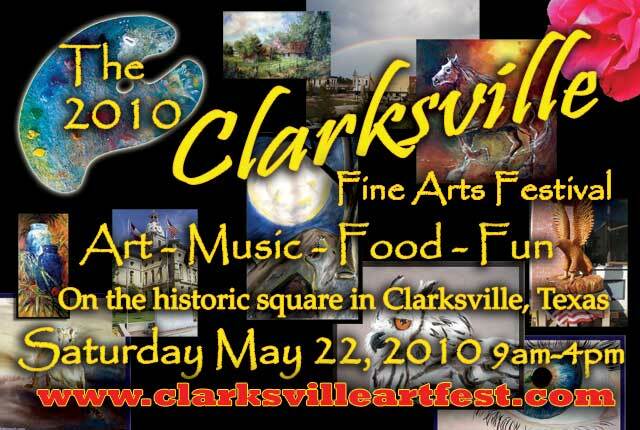 This year the 2010 Clarksville Fine Arts Festival will be Saturday, May 22, 2010, from 9:AM to 4:PM on the historic square in Clarksville, Texas. This year’s festival is going to be a great one. The artists’ booths are all reserved! There will be glass blowing demonstrations, music, wood turning demonstrations, plenty of food, and a full house of talented artists to meet! I’ll be there signing books and will also have original art and some prints. Art. Music. Food. Fun. What else could you need? Come on by and see me! We’ll have a house full of guests, be mucking about the square all day Saturday, and we’ll be at the Wine and Cheese event Friday night as well. Come see us. You’ll have a great time! Directions and more information are here.